NEW: Spiritual Intelligence – beyond Emotional Intelligence! My new organizational and coaching practice! What is the difference between Emotional Intelligence and Spiritual Intelligence? What are the SQ21 skills, knowledge and experience you will gain from this process? My role as a leadership coach and organizational transformation consultant, and how I serve my clients! The model that I propose that underpins everything in strategic organizational alignment process and best describes what effective organizations need to do is called the “Trialogue”. 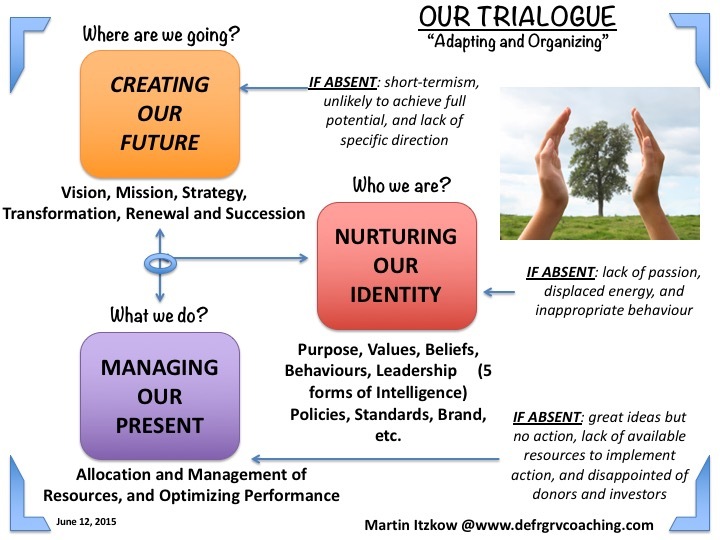 The Trialogue is based on what effective organizations of all kinds need to do to remain viable. It sets the conditions and the ways the organizational systems need to make decisions and how they must align with the expected organizational performance. This is about what we do every day and seeing our activities bear fruit. It is right to give attention to improving the ways we do our everyday work and to enjoy the good things happening around us. The risk is that managing the present absorbs all energy and we tend to lose sight of where it’s all going and what it is all for? The question here is to ask: What will we need to do tomorrow? This creates the future as we stand back and scan the horizon. What is happening in the world? Would do we need to do to remain relevant in our new worldview that ensures our activities meet tomorrow’s needs and not just today’s? It is true that organizations that do not find time to do this will find that it has become yesterday’s news. Perhaps it is sad but true that they may fail, be irrelevant, fade away, and/or limp along. The adaptive organization is able to nurture their identity. It is able to answer the question: Who are we? It actively nurtures a shared understanding of identity. How are we to make choices about something as challenging as our future? Clearly, there is a need for good information and a compelling rationale. We make pragmatic judgments about what is possible and achievable. However, that may not be enough. I believe that will be necessary, however, to undertake this inquiry in a way that allows sufficient thought, depth and authenticity to take place. The task here is not to identify what we aspire to do so much as what we actually believe and have at least a measure of commitment to do. It may be true that we often fail to live up to our principles unless we are clear about our real values and how we will be living these in a range of real-life contexts. Perhaps, there is a belief with some people that the requirement for authenticity means that the conversations that the organization will have about their identity are often profound, revealing and challenging. What are we passionate about? Can we be best in our world? What drives our organizational engine to be successful now and in the future? These Trialogue activities are not separate. They interact with each other and influence one another, like a continuing conversation. I believe that all leaders in organizations need to decide who and how these three conversations are to be managed and by whom? The Trialogue model is a recursive concept where the questions it poses need to be asked at each level the organization and, ultimately, by every individual providing services. This means that every layer and group in the organization has to make sense of things in these terms.